Mary lives in a village - an island in the middle of a forest - ruled by the Sisterhood, protected by the Guardians, and in a perpetual state of fear. The fence that surrounds her village keeps out the constant and always present terror: the Unconsecrated - flesh-eating undead who constantly throw themselves at the chain-length fences, driven mad by an insatiable hunger. The Sisterhood, the religious sect that maintains order in the village, is in charge of the survival, and submission, of everyone enclosed in the fence. But the passion in Mary cannot be contained, and she cannot get the stories her mother tells her about the ocean out of her head as she desperately tries to keep herself from being married off to a man she doesn't love. Then, suddenly, the fences are breached and Mary, along with a small group of survivors, must make their way through a gated path that travels deeply into the Forest of Hands and Teeth and into a world they have never known. Mary's passion and desire constantly battles the edicts of submission that have been instilled in her heart. She is a quick and courageous character, and her genuine emotions of love and wonder keep her close to the reader's heart. Though the plot loses some steam near the end of the novel, readers will stay perched on the edge of their seat until the very last word. This book kept me completely engrossed from page one. 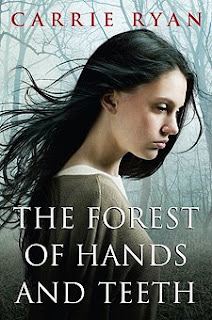 I even dreamt one night that I was in the Forest of Hands and Teeth with the Unconsecrated chasing me! Though Ryan leaves some minor questions unanswered, the entire novel is completely compelling and will keep the reader completely engrossed until the very end. The ending seems a little less nile-biting then the rest of the book, but even so, the moment I closed the book I realized I had been holding my breath the whole time I had been reading. I just finished reading this book last week and definitely enjoyed, but I would say that the questions left unanswered weren't entirely minor. For instance, what was up with the Sisterhood and their secrets? What did they have to do with Gabrielle's turning and for that matter, who exactly was she and what was she doing in Mary's village to begin with if her own village had become overrun? Of course, these are probably questions which will be answered with the next installment.